Jon Stewart fans -- including Bruce Springsteen, Stephen Colbert and John Oliver -- converged on a Manhattan studio Thursday to say goodbye to his "Daily Show." The satirical news anchor will sign off with a special 50-minute-long episode Thursday. There was a long line of hopeful audience members outside Stewart's studio on the far west side of Manhattan all day Thursday. "This is a historic day," said Kari Lynn Hearn, who got in line at 7 a.m. The taping will start around 6 p.m., and the episode will air at its usual time, 11 p.m.
"There's been a lot of time and energy and love put into what Thursday night will be," Comedy Central president Michele Ganeless said. She declined to reveal anything about the guests; Stewart and company want to keep it a secret until showtime. Springsteen and his E Street bandmates were seen at the studio early Thursday afternoon, possibly for a rehearsal. And a number of former "Daily Show" correspondents, including Colbert, Oliver, Steve Carell, and Lewis Black, walked in through a side door. 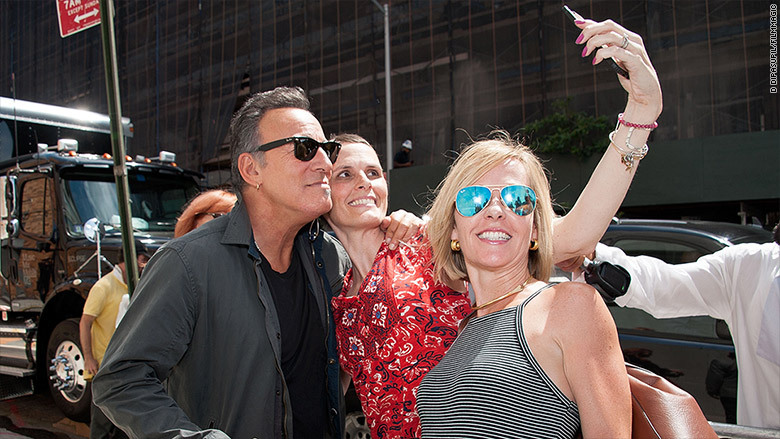 Bruce Springsteen took a selfie with a fan before Jon Stewart's final show. 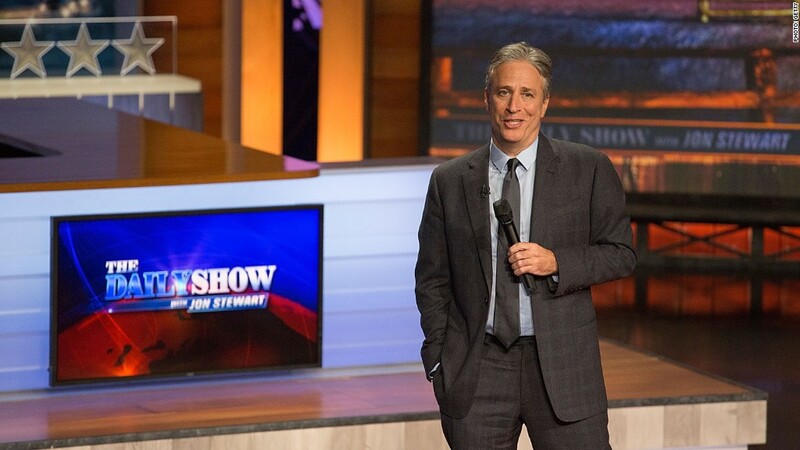 Stewart, 52, is a seminal figure in both news and comedy. Fans have been showing up early all week long, hoping to be a part of the final few episodes. "It's the end of an era, just like when David Letterman retired," said Jennifer Robinson, 37, who arrived from Missouri on Wednesday. "Stewart has such a unique voice and I think he speaks to a lot of people who don't have a voice." Robinson scored tickets online on Tuesday and flew in for Wednesday's taping. The penultimate episode featured a sentimental Stewart who quipped that "the world is demonstrably worse than when I started. Have I caused this?" Leselle Hatcher, 27, was also there on Wednesday. She had been in the audience four times before, but felt that Stewart's last week was something special. 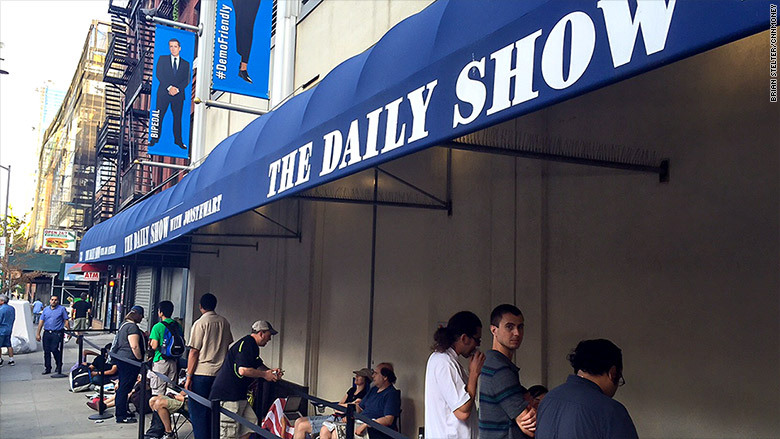 "Daily Show" fans line up to bid farewell to Jon Stewart. "I think there are other important figures in media, but Jon Stewart... he kind of revolutionized how our generation interacts with the news," she said. She described turning on "The Daily Show" at the end of the day and hearing Stewart "articulating everything I was thinking and feeling about." Of course, Stewart has many detractors as well -- people who say he took cheap shots and showed too much of a progressive point of view. One such friend/foe, Fox's Bill O'Reilly, wrote an "appreciation" to Stewart for Deadline on Thursday in which the conservative host said that Stewart was "great at what he did...Whatever that was." It's possible that O'Reilly or some of Stewart's other "frenemies" will show up on the finale -- there was a report last month that "Daily Show" producers had invited people to "turn the tables on him." Truth be told, Stewart oftentimes took liberal positions, but his satire crossed party lines and demonstrated how humor can be used to hold politicians and cable news pontificators accountable. In recent days some commentators have even compared him to Walter Cronkite. One of the show's former correspondents, movie star Ed Helms, took to Twitter Thursday to express how much he'll miss the long-time host. Jeff Vasquez, 31, and Mike Kerrigan, 26, both drove down from Rhode Island and waited in line from 9:30 a.m. to see Stewart off on Wednesday. "I watched since [Craig] Kilborn was the host," Vasquez said. "I started when I was 14 and I'm 31 now. And seeing Jon leave, I don't think Jon appreciates the effect he's had on people." But Comedy Central does. On Thursday the channel took out a full-page ad in The New York Times to pay tribute to Stewart. One of Stewart's funny foes, Arby's, also marked the occasion this week by buying two ads on Wednesday's show. Stewart never passed up a chance to make fun of the fast-food chain, and one of the ads showed a series of the comedian's insults, along with the song "Thank You For Being A Friend." The "Jon Voyage" farewell tour -- as the channel has called it -- has been leading up to Thursday ever since the host announced back in February that he was ready to call it quits. And now, with only one show left, a media world without Jon Stewart is becoming a reality for many of his adoring fans. Where will they get their news now? "I don't know," Hatcher said. "CNN, maybe?"